Enjoy a half- or full-day journey down the beautiful Colorado River. 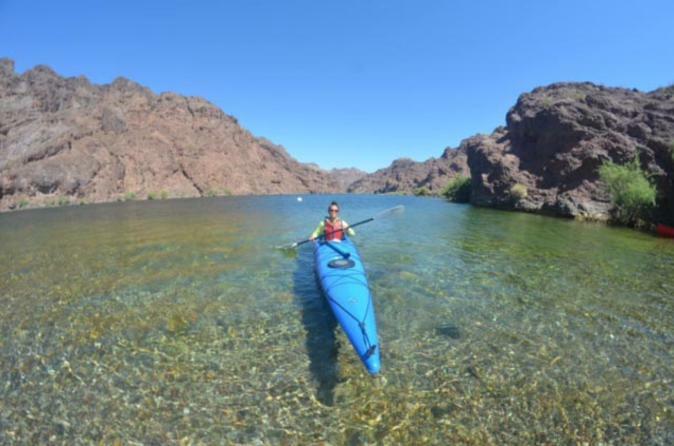 As you paddle into the Black Canyon, take in the beautiful desert scenery and watch out for Big Horn Sheep, deer and even Bald Eagles. Visit Willow Beach, Emerald Cave and the cool, clear waters. Hotel pickup and drop-off, all necessary equipment, snacks and bottled water are included. Join your guide for a half- or full-day kayaking tour along the Colorado River and into the Black Canyon. All necessary equipment, National Park fees, snacks and hotel pickup and drop-off by a comfortable Mercedes Sprinter are included. Review options below for more information. Half-day Tour (4-miles/6.4km round-trip): After hotel pickup you will arrive at Willow Beach where your guide will get you prepared for the day ahead. After you are fitted into your kayaks you'll start paddling upstream into Black Canyon. As you take in the natural scenery around you, scour the banks to be the first to spot Desert Big Horn Sheep or look above and see if you there are any Bald Eagles. You’ll then break and enjoy a complimentary snack before setting off for Emerald Cave. Plunge into the cool clear waters before the group heads back to Willow Beach. Full-day Tour (12-miles/19.3km one-way): After pickup you’ll be transported to the launch site at the base of the Hoover Dam for a prompt 7am launch. Your first stop will be one-mile upstream at a historical overlook where you’ll see amazing views of the legendary Colorado River. Your guide will provide you with expert commentary about the history of the river. Make sure to keep an eye out for Big Horn Sheep and all the other critters that the desert has to offer. As you paddle down the Black Canyon with you guide, you’ll stop along to way to see historical artifacts and natural features. After your first 4-miles you will be treated to amazing natural occurring 100-degree hot springs. Break for lunch at a beautiful beach by the river before finishing your day with a visit into Emerald Cavern. Your day will end at Willow Beach where you’ll be shuttled back to Las Vegas. Important note: in order for the local operator to obtain the necessary permits for this tour ALL traveler names must be provided as they appear on a government-issued ID such as a driver's license or passport. Your tour will not be confirmed unless all names are provided. Please ensure all names are spelled correctly, names cannot be changed once reservation is submitted.